MOBA games are pretty popular on both PC and mobile platforms. This genre, which started years ago as a Warcraft III mode, has become a game category by itself over the years. Combining RTS and RPG elements with dynamic gameplay, MOBA games offer a very entertaining from start to finish. There are literally hundreds of heroes in these games, each with a different skill set. In order to win matches, you need to have an idea of each one’s abilities. You are not required to master them all but this is the only way to learn the disadvantages of enemy heroes. In addition, you have to master the map you play, know each lane, and establish a perfect balance between attack and defense. 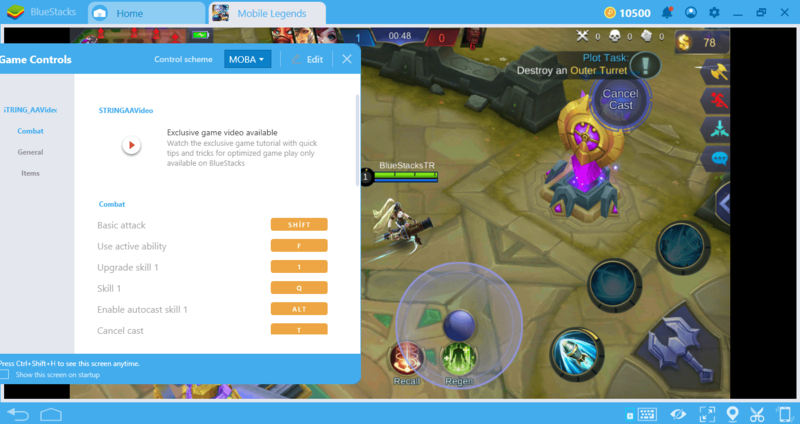 The standard mobile control scheme is not enough for MOBA games. First of all, it’s not sensitive enough. You manage your hero by “touching” the ground and determine where it should go. This is a much more important issue than you might think, because how sensitive “touch” the ground determines whether you stay within the range of a tower or an enemy hero. If you watch the professional MOBA matches, you will see that the combat between two heroes is almost like a dance: While the opponents are managing their heroes, they are doing millimetric calculations and controlling them like this. Even a difference of only a few inches can determine whether you will win an encounter. In short, you need a control scheme that is at least as precise as FPS games. Otherwise, even if you are a skilled MOBA player, you won’t be able to use your skills in the game. In other words, you need keyboard and mouse controls. The required control sensitivity can only be achieved with these devices. Using the keyboard and mouse gives you a much more dynamic and controlled gaming experience: You can switch between lanes faster and gain an advantage over enemy heroes easily. Do not let a tower kill you because you are in the wrong place: With precise controls, you can stay out of the tower range and still attack. 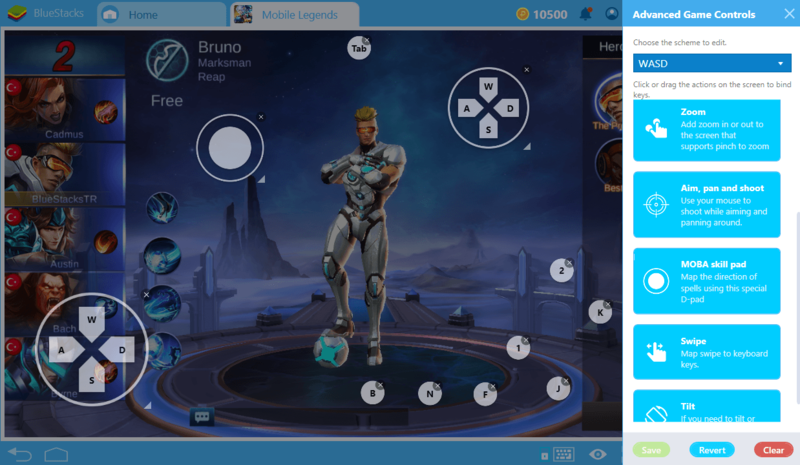 BlueStacks 4 has a special control scheme for MOBA games. This is quite different from our standard WASD scheme: It allows you to move much faster on a map and from an isometric point-of-view. 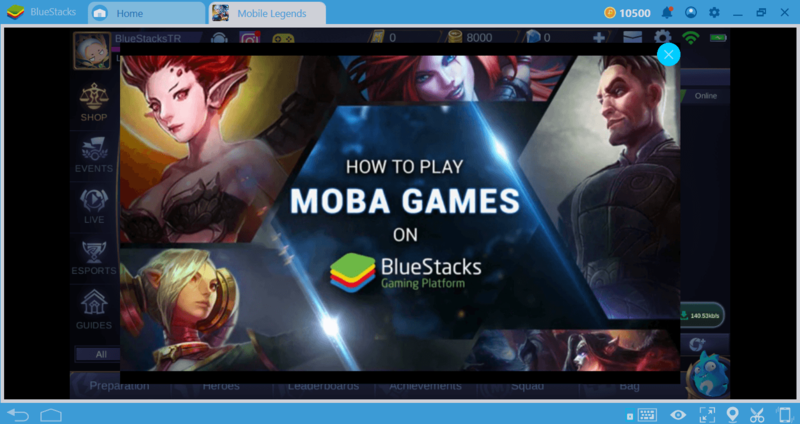 When you install a MOBA game to BlueStacks, this scheme will be ready to use and you will not need to make any additional adjustments. The most striking feature of this scheme is that it assigns almost all functions to the mouse: You use the mouse instead of the keyboard for movement control. So how do you use your character’s skills? With the key mapping tool, it’s easy to do: You can assign a keyboard shortcut for each skill. Do you want to use your heal ability quickly? Or do you want to use the most powerful attack at the right time? With the BlueStacks 4 key mapping tool, you can do all of these without taking your eyes from the screen. Move your character with your mouse and use your keyboard to attack: Mobile MOBA games have never been so easy to play. Of course, as you play on a higher resolution and bigger screen, your environmental awareness will also increase: You will be able to see a much larger portion of the map and easily understand where to go. 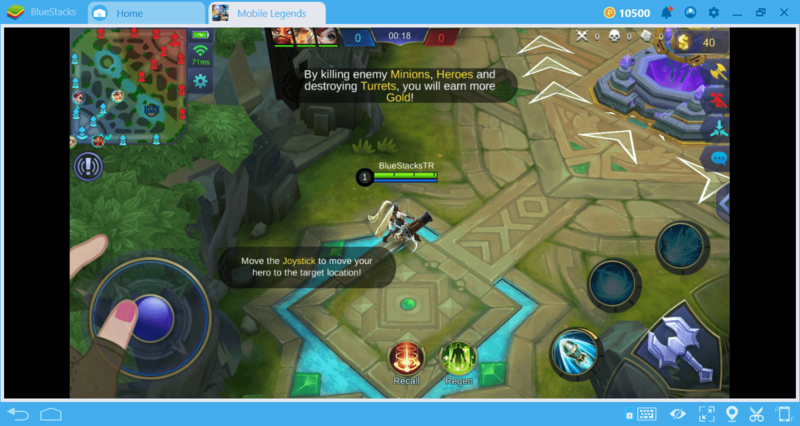 BlueStacks 4 will make mobile MOBA games more enjoyable and allow you to use your talents in the game. From the “Top Charts” section on BlueStacks 4, you can see a list of MOBA games you can try right now. 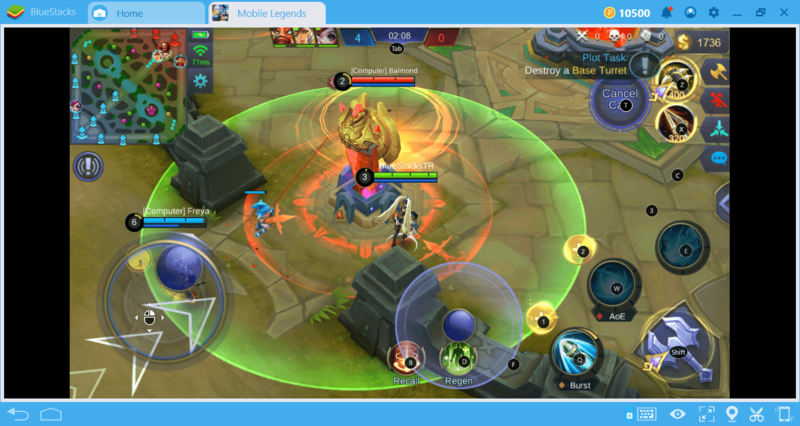 Start with Mobile Legends: Bang Bang if you are looking for the exact counter-part of League of Legends on mobile. If trying something different and unique does not scare you, Heroes of Order and Chaos would be a pretty good choice. Or, you can opt-in for advanced graphics and choose Vain Glory. In any case, we are sure that you will get an unforgettable experience.